Explore the tradition and charm of hand-printed images, rich inks, and beautiful papers. 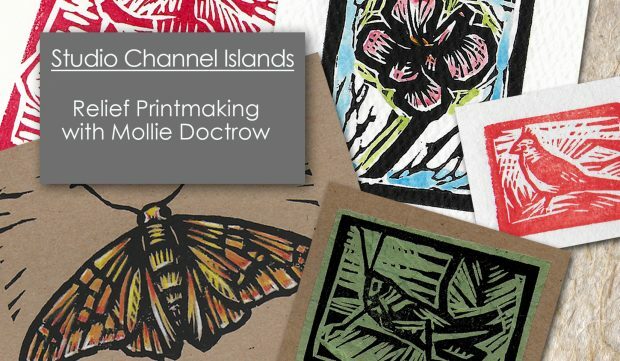 Learn the art of relief printmaking, from drawing and design tips, to carving and printing. Bring a favorite sketch or photo and interpret it as a graphic linocut. Make black and white prints and explore creative options, combining prints with watercolor and collage techniques. Working from natural and photographic resources, students will design a print, transfer it to a block, and learn carving techniques. During the second part of the workshop, students will learn the printing process, making black and white prints and exploring creative options. Printing options include colored inks, combining relief prints with watercolor, and collage techniques. All materials provided, including carving blocks, carving tools, inks, and papers. Image size will be 3″ x 4″. A handout with print history and terminology will be available. The workshop is suitable for beginning and intermediate students.